Give yourself more room for living without all the growing pains. 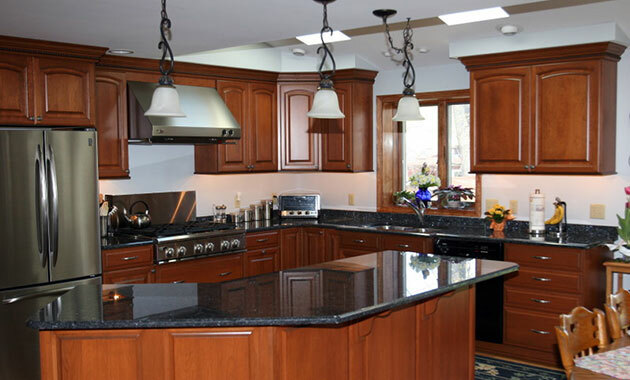 Satisfy your craving for a custom-designed kitchen that incorporates the features and functionality you’ve always wanted. While TV’s most revered TV chef passed on in 2004, Julia Child's kitchen lives on as a permanent exhibit in the Smithsonian Institution’s National Museum of American History. Tips for Improving Your Kitchen. Get your creative juices flowing with tasty kitchen design ideas from Kitchens.com, House Beautiful, and HGTV. Open + Bright – Opened-up kitchen spaces with added windows, skylights, and both hidden and statement lighting fixtures - some even with a unique LED bulb color - have been hot lighting trends this year. Decor "Goes Green" – Moving away from the synthetic stainless steel look, this year's kitchens are all about natural hardwood, bamboo, and granite. Couple this with a huge influx of energy efficient appliances and low flow faucets, and we're seeing a much "greener" kitchen all together. Hot Colors – Fiery hues like deep reds, faded coppers, warm cinnamon, ginger, burnt oranges, buttery yellows, rich coffee, punchy apricot, and/or rich clay tones are heating up kitchen designs across the country right now.